What would you suggest currently in Synthesis? Circle of Nostalgia with Agony Crawler/ HoA reduced mana reservation or Calamity? Cause getting a nice Circle of Nostalgia would be great, however, that would make Calamity likely not the best option? Or maybe there's another version of Circle of Nostalgia that can be used? Calamity and Nostalgia are not really compatible. Calamity will override the reservation and make it 45% no matter if you have Nostalgia + less reservation Uber Lab enchant. DPS wise you will need at least one +1 lvl roll and +maim on a rare chest to match the DPS of +2 lvl Calamity. 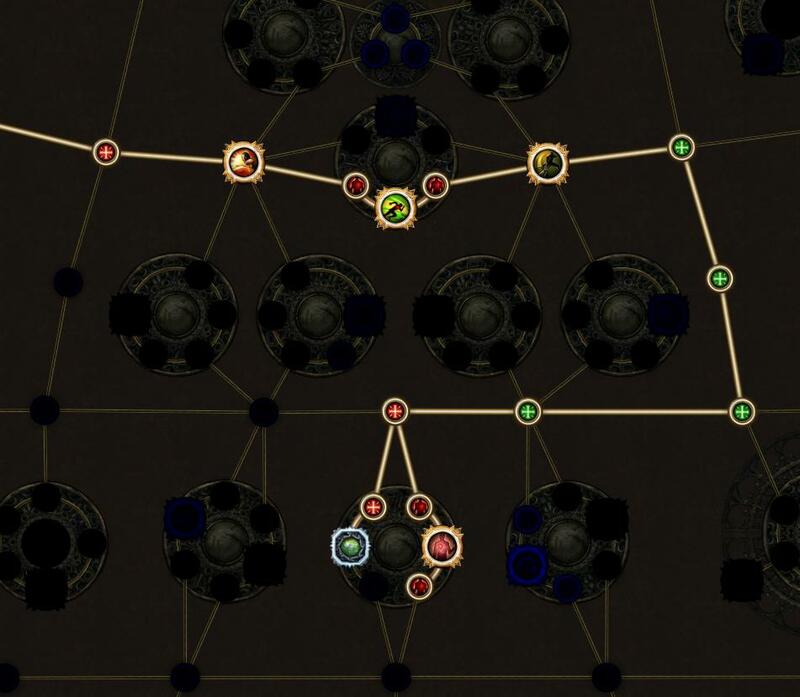 I suggest Calamity 5L to get started, as DPS is more than enough, but of course try to get 6L, but for ultimate DPS save to craft a Shaper Astral Plate like the one I mentioned my previous post +Nostalgia. Thanks for reporting your success! Would it better to keep unset ring with vaal lightning trap or get a Circle of nostalgia with good agony rolls? Nostalgia only comes into play if you have a GG (+gem lvl, +maim) chest to replace Calamity, if you don't, Calamity + Vaal LT are better. Sometimes things are right in front of your eyes and you just don't see them. This goes a long way towards alleviating DEX issues. I'll update main post tomorrow with change. Not a huge boost, by any means, but this game is about combining tons of little effects that add up, and for 1c, how can one pass up? Thank you for this nice build. I am enjoying it a lot so far. Do you have any advice on how to go about getting the right socket colours on the chest? Is the crafting recipe (once I get it) for 3 green sockets the cheapest option? Cool ) glad you are enjoying!